Without question, aluminum wall brackets serve as the fundamental building blocks for a properly designed rainscreen wall assembly. They provide advantages from a Continuous Insulation (c.i.) perspective and also provide practical installation advantages. Bracketed systems allow materials to be rapidly set even when backup walls are not plumb or true. Through our partnership with ECO Cladding, all of our products are supported by aluminum Alpha Brackets - the building blocks for effective C.I. Subframing and Panel Subframing installation. For all of our products, we base our systems from two primary bracket types – vertically oriented Alpha V Wall Brackets and horizontally oriented Alpha H Wall Brackets. 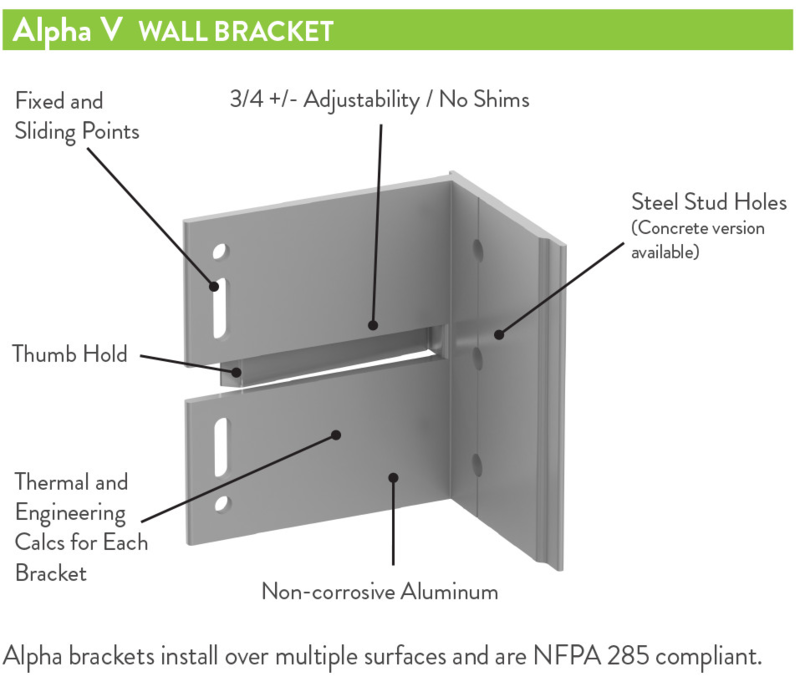 The Alpha V Wall Bracket is most commonly used for installations over concrete substrates, including block/tilt-up or brick masonry wall assemblies. L and T profiles are mounted vertically to Alpha V Brackets and the subsequent attachment profiles will vary depending upon system type and fastening approach. Built into each Alpha Bracket is +/- 3/4″ of adjustability – perfect for backup walls that are not exactly plumb or true! In addition, vertical Alpha V brackets are available in twelve sizes to create various cavity depths. The number of fasteners back into the sub-structure will be optimized based on load requirements and back-up wall type. 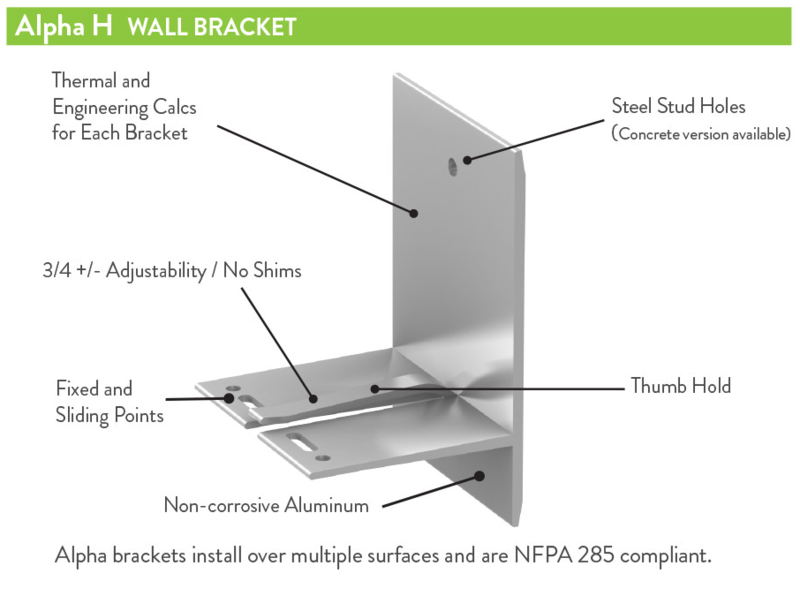 The Alpha H Wall Bracket is most commonly used for installations on steel stud / sheathing substrates. 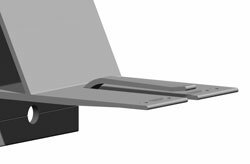 With a majority of North American installations on stud wall assemblies, the horizontally oriented Alpha H Bracket is the go-to bracket for many of our designs. L and T profiles are mounted horizontally to Alpha H Brackets and the subsequent attachment profiles will vary depending upon system type and fastening approach. Built into each Alpha H Bracket is +/- 3/4″ of adjustability – perfect for backup walls that are not exactly plumb or true! The Horizontal Alpha H bracket comes in eight sizes to create various system cavity depths. Based on various load requirements, the number of fasteners back into the substructure will be optimized based on load requirements and back-up wall type. The “thumb-hold” feature of Alpha Brackets allows the system to have a +/- 3/4″ adjustment without the need for external shims. And when we say “we’re all thumbs” – that’s a good thing since the slotted feature of the brackets hold the primary system profile until it can be fixed with a fastener eliminating the need for clamps or an extra set of hands to hold things in place while leveling. This feature is also perfect for existing out of tolerance walls in recladding and retrofit situations.